If you're new to 52 Quilts in 52 Weeks, you might wonder what the "UFO Challenge" is. Go to this post to learn how to play along. There are still five months left in 2013, that's five UFOs you could finish before the end of the year! Go ahead, run and check on what is your #11 project. Then come back and see what everyone finished during July. July is a tough month for quilters. 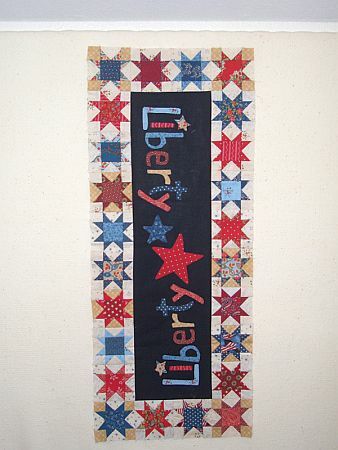 What with school vacations, family commitments, quilt camp . . . . But our intrepid UFO Challenge contestants stepped up to the plate and finished some wonderful UFOs this month! 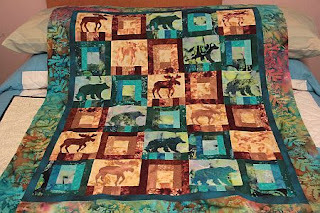 I don't have the excuse of school kids or family vacation, but I did spend a week in Wyoming attending Quilt Wyoming and visiting nine shops on the Southeast Wyoming Quilt Shop Hop. 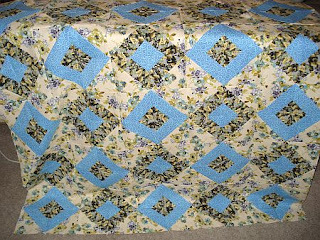 I also had to finish two Jelly Roll Party samples, two Scrap Squad quilts and my #8 UFO. The first UFO completion came early in the month from Carol in Idaho. Aren't the colors gorgeous? Sandi has another "K" quilt. This one is called "Kubicles," and she blogged it here. Not only is it a UFO, it's a scrap project. She says it should make a great baby quilt -- I agree, don't you? 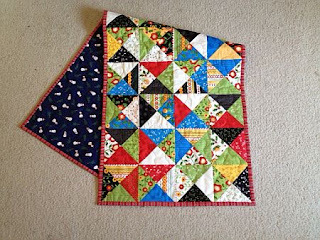 The red border one is from the 2007 Quilting page-a-day calender and my first try at paper piecing. 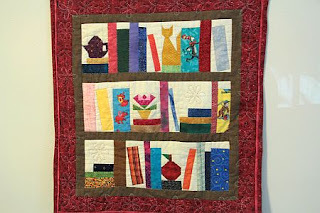 I had planned to have this in my library office when I was working, but now it can hang in the living room. Don't you just love being retired, Irene? The second one is from a pattern she bought while on a cruise to Alaska in 2012. She says "quilting it can be the UFO project for 2012!" 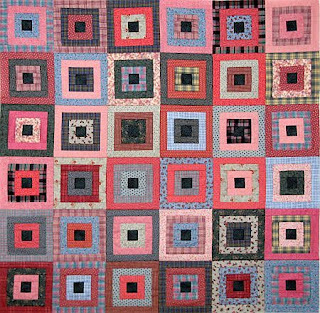 Irene detailed both quilts on her blog here. My finish is one from 2005 - pre-children! It was on my UFO list despite me reaching a point of not liking anything about it anymore - but with 400 flying geese units made I was past the point of no return! I like it a bit more now it's actually together and I will quilt it when we get back from France. 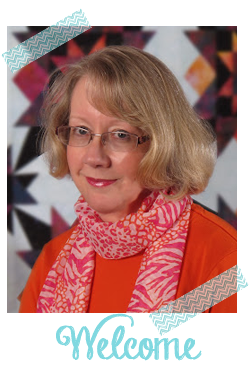 Karen says she's been knitting rather than quilting. Karen, we'd love to see some of your knitting finishes, also! Oh, hey, look at this! 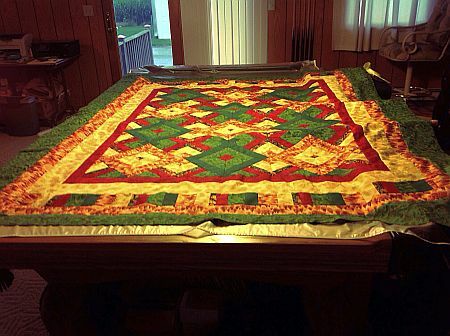 Karen did get her July (#8) UFO finished! 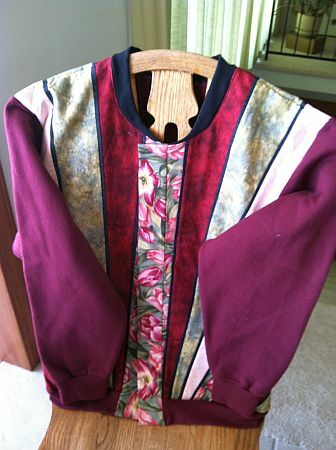 Karen tells me the fabric is "The Caroler" by Mary Engelbreit. I love that line! 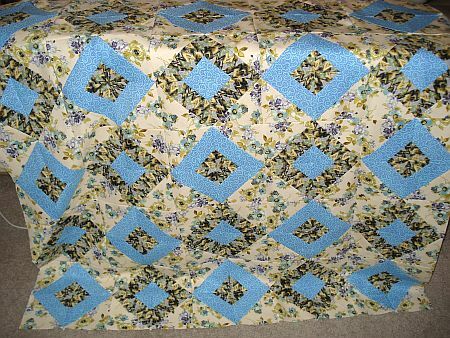 Her tablerunner is made from a turnover Karen bought from Missour Star Quilt Co. years ago and "never figure out what to do with." 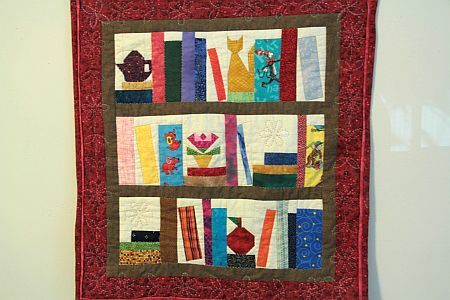 We agreed it's a good idea to buy some yardage from the same line as precuts, because you never know what you'll want to make with the precuts! Because the precuts usually arrive at my LQS weeks or even months ahead of the yardage, I leave them on the cutting table until the yardage is available at Ruth's Stitchery. The staff at Ruth's is so good about looking up what they have on order, so I know if I need to search further afield for a particular line. Susan in Australia has a funny story about her July finish. Here is the story, and here is the photo. Pretty, isn't it? 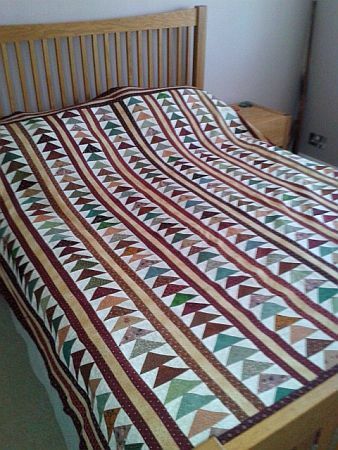 We'll look forward to seeing your machine quilting project, when it turns up! 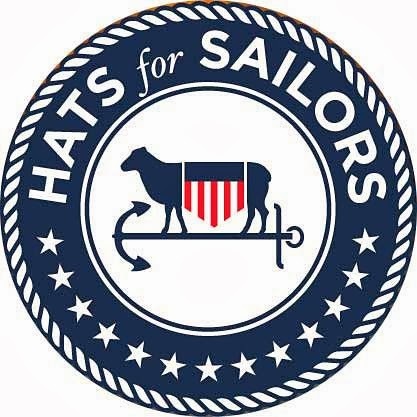 By the way, My Little Sailor (Younger Son, and the blog's co-author) is in Brisbane this week. Wave to him when the ship pulls out, please, Susan! Here is the link to Sue's blog post describing the quilt. 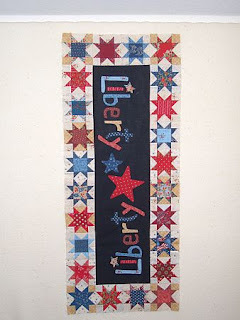 I want to add this one to my "Scrap Quilt Ideas" folder! 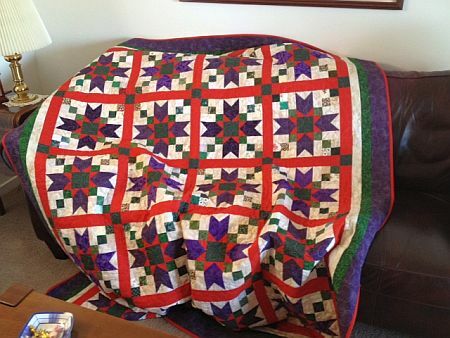 Debbi had a little trouble getting a good photo of her quilt, because of bad weather. 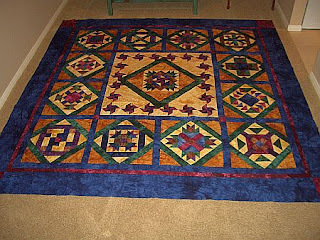 The first one shows the colors most true, and the second shows the whole quilt. 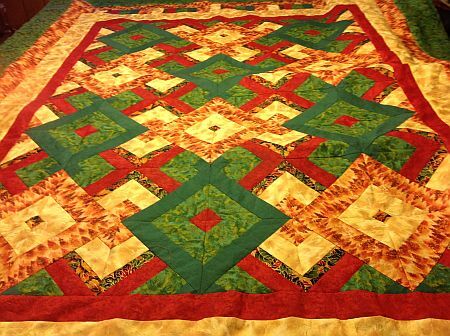 Debbi told me this is a "Hidden Wells" quilt. Searching for the pattern, I found this tutorial from Moose Stash Quilting. Very pretty, Debbi, I'm going to add it to my "Sunday is for Scraps" folder! I count 12 finishes, plus my own. Wow! That's pretty impressive for a summer month! 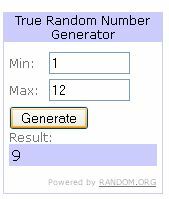 I'm not counting my own for the giveaway winner, so let's see who the Random Number Generator chooses. And the best part is, it's available as an e-book. So I can send it to you right away! Tomorrow is my day on the Ho Ho Ho Blog Hop. I hope you'll come back to see what I "whipped up" for Winter! So many pretty finishes again. Congratulations Sue! Wow, lucky me! 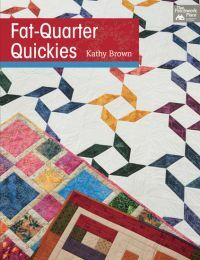 I like the sound of a book full of quickies! By the way my Auntie's birthday is on the 1st of October so not a shared birthday for you after all! Another terrific group of finishes this month. It would be interesting to count them all up at the end of the year and see how many we all managed to churn out this year! This might be the best collection yet - I seriously cannot pick a favourite. Some I'd like to try - a lot I'd like to own. Yes, Marti - I will wave "bye bye" to Your Little Sailor.